The Emirates A380, on display at the Bahrain International Airshow, received visits by top dignitaries VIPs, on the first day of the show yesterday (November 14). The visitors included Mohammed bin Salman bin Hamad Al Khalifa, the son of the Crown Prince of Bahrain; Sheikh Theyab bin Mohammed bin Zayed Al Nahyan, the son of the Crown Prince of Abu Dhabi; and Sheikh Mohammed bin Hamad bin Tahnoon Al Nahyan, vice chairman of Abu Dhabi Airports and managing director of Royal Jet; and Tony Douglas, chief executive officer of Etihad Aviation Group. The visit was part of the official opening tour for the airshow. The VIP delegations were received by Adel Al Redha, executive vice president and chief operations officer for Emirates, and Adil Al Ghaith, senior vice president, commercial operations, Gulf, Middle East & Iran for Emirates, who took him through the flagship aircraft’s signature design details and latest onboard products. The Emirates A380 is the largest aircraft on display this year at the Bahrain International Airshow. At the last Bahrain Airshow in 2016, more than 8,000 visitors toured the Emirates A380 on the show days. 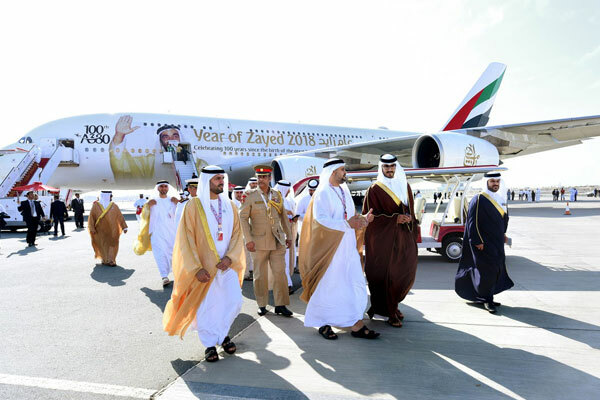 The airline is displaying its 100th A380, which has been emblazed with a decal of HH Sheikh Zayed bin Sultan al Nahyan, the UAE’s founding father. The Emirates A380 on display features 14 luxurious First Class suites, 76 flatbed seats in Business Class and 429 spacious seats in Economy Class, as well a refreshed Emirates’ OnBoard Lounge. The new OnBoard Lounge includes more seating options, mood lighting, a new wooden finish, modern detailing, a special sound system, among a number of other features. Emirates is the largest operator of the A380 with 105 in the airline’s widebody fleet and a further 57 on order. The Emirates A380 currently operates to 50 destinations and has carried over 114 million passengers on over 129,000 flights since going into service in 2008.